Thompson and Fitzgerald are Excited for the Winning Culture · Let's Go Amerks! It’s the time of year for minor league hockey teams to experience a lot of roster change. Players being called up, sent down, draft picks out of college, draft picks out of juniors, and even undrafted free agents. Nine players will have passed through Rochester as part of a transaction this week. One has made an Amerks debut and two more are expected to debut this weekend. Defenseman Kurt Gosselin played his first AHL game on Wednesday night, Tage Thompson was assigned from Buffalo on Thursday and is expected to play tonight, and defenseman Casey Fitzgerald who finished his senior season at Boston College and hopes to play in one of the two weekend games. In case you missed them here’s all of the moves: 3/24 Pilut assigned to Buffalo from Rochester. 3/25 Judd Peterson assigned to Rochester from Cincinnati. 3/26 Kurt Gosselin assigned to Rochester from Cincinnati. 3/26 Will Borgen assigned to Buffalo from Rochester. 3/27 Victor Olofsson assigned to Buffalo from Rochester. 3/27 Casey Fitzgerald signed PTO out of Boston College. 3/28 Tage Thompson assigned to Rochester from Buffalo. 3/28 Matt Tennyson assigned to Buffalo from Rochester. 3/28 Arvin Atwal assigned to Rochester from Cincinnati. phew. That’s a lot of movement. The Amerks will have the chance to clinch a playoff spot tonight with a win and Cleveland loss and continue to play meaningful games – something that’ll be new to Tage Thompson this season. The season has been full of mistakes in Buffalo. In terms of play, Tage Thompson should have been playing in Rochester earlier in the season to learn from those mistakes on an individual level and work on his game. When a new player joins a team they can be hesitant or an observer. That didn’t apply to Tage on Thursday. It helps that he already knows a lot of the players and the coaches from camps. Thompson is going to be expected to create offense and will get the chance skating on the top line with Kevin Porter and CJ Smith. Thompson found out at the trade deadline that he was going to be assigned to Rochester to adjust and get his feet wet without having to jump right into the playoffs. In other words, the move this week wasn’t a surprise to him. A willingness to be assigned, play whatever role he’s given, and embrace the opportunity is all that can be asked of an NHL player being sent down to the American League for the first time in late March. Just as Victor Olofsson, Will Borgen, and Alex Nylander are getting a bigger taste of the NHL it’ll be an AHL experience for Tage Thompson. He’ll have the chance to win another championship with a former teammate, Casey Fitzgerald. They both played together at the 2017 World Junior U-20 Championships tournament where they won gold with Team USA. 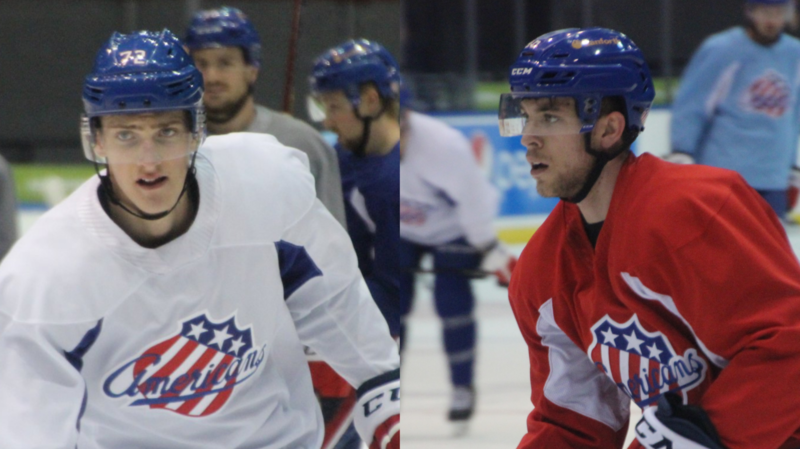 Thursday was also the first Amerks practice for both of them. “Was awesome having a familiar face in the locker room,” Casey Fitzgerald said after practice. Another connection that Fitzgerald will have is that he was roommates with Lawrence Pilut last summer at the Buffalo Sabres development camp. It was the third development camp for Fitzgerald and with that experience he made sure to reach out to younger or first time players at camp to help to make sure everyone was interacting as a group. Arriving in the Rochester locker room wasn’t unfamiliar territory. He already knows Asplund, Olofsson, Nylander, Cornel, Pekar, Oglevie, Hickey, and Pilut. Casey Fitzgerald isn’t just learning to be a pro hockey player but is learning with school work as well. He’s taking two classes and finishing up his psychology degree to graduate from Boston College. The Rochester Americans only have three home games left in the regular season starting tonight against Laval Rocket. They’re coming off of a 5-4 overtime loss on Wednesday night. CJ Smith missed a majority of the game on Wednesday due to illness. He’s been sick all week but is hopeful to play Friday night. Zach Redmond remains out with a lower body injury. He’s considered day to day but isn’t expected to play this weekend. Andrew Oglevie is also out of the lineup on the injured list. Matt Tennyson was a late call up to Buffalo on Thursday afternoon. Arvin Atwal was called up from Cincinnati as his replacement. We’ll find out around game time if he plays or the coaches are confident enough to put Fitzgerald right in. If CJ Smith can play the only expected lineup change Friday night with forwards would be Tage Thompson playing and Tyler Randell being scratched.